The tourism market in South Korea is heavily dependent on China and Japan: the two countries combined provided around 60 percent of its tourist inflow in 2012. Of all the incoming tourist, leisure/holidays travel owned the biggest proportion of purposes with 44 percent according to data in 2011. Business trip ranked second with a 25 percent. Shopping, dining in restaurants and sightseeing were the top three activities with a participation rate of 89%, 61% and 39%, respectively. 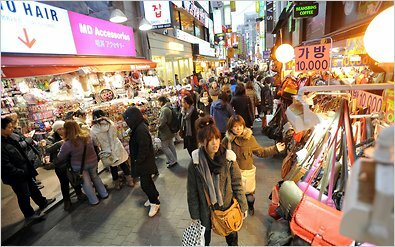 The tourism market in South Korea is an important component in its national economy. In terms of direct contribution, which includes accommodation, transportation, entertainment, food and beverage services, retail trade, and tourists’ travel spending, the contribution of tourism to GDP in 2013 was KRW27,126.8 billion, or 2.1 percent of GDP. This indicator primarily reflects the economic activity generated by industries such as hotels, travel agents, airlines and other passenger transportation services. It also includes the activities of the restaurant and leisure industries directly supported by tourist. The majority of the contribution actually lies on the indirect contribution, which includes tourism investment spending, domestic purchases of goods and services by the sectors dealing directly with tourists, such as purchases of food and cleaning services by hotel, and government’s collective spending, such as resort area security services, totaling to a 3.7 percent of GDP contribution in 2013. In the span of the world, it is ranked eighteenth in absolute size. The tourism market in South Korea also holds an important role in providing employment opportunities. In 2013, tourism industry generated 616,000 jobs, or 2.1 percent of South Korea’s total employment base, ranking 14th among major industries. It also holds approximately 25 percent of the retail trade sector, which had the highest employment contribution in South Korea in 2013 at 7.9 percent. One of the characteristic of the tourism market in South Korea is that it is largely aided by the government. In 1999, a five year plan named ‘Tourism Vision 21’ was established, and tourism was within the scope of national policy. Recently, government agencies like the Ministry of Culture and Tourism call for the spending of 16.8 trillion for projects to develop the tourism market in South Korea, such as building more hotels, shopping malls and so on. More and more countries starts realizing the importance of the tourism market as the new force driving the economic development, especially in the 21st century. Also, as countries gradually upgrade their economic structure, the importance of service industry will be more emphasized. The tourism, as one of the major industry in the service sector, will definitely continue to grow. In this case, the government of South Korea is a model for the world for its commitment in developing the tourism industry.